Our Sony Radio Codes are available 24 hours a day 7 days a week. Our Ford V radio codes are availableinstantly after purchase. We guarantee our radio decodes work, that’s why we offer a 100% money back guarantee! Showing your Sony radio serial code on the radios display. 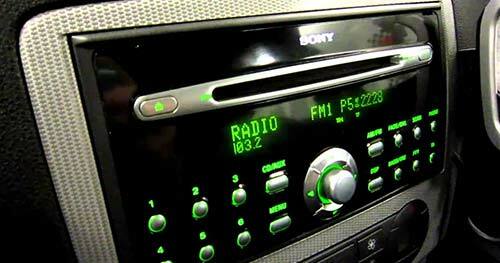 If you have a Sony radio as shown in the image, these radios must be removed in order to get the serial number. Please see below on how to remove this particular stereo. Upon holding buttons 1 & 6 together, a cycle of different codes will appear. The serial will display towards the end of the cycle. As shown within the image , the Sony Radio serial number is displayed as "SN: SOCD1X8V061197" the information needed is only V197905 from the display. It is quite simple to remove your Ford radio. You will need a set of radio release keys. These are inexpensive and are around £3 - £5, you can obtain them from a local car audio shop or Amazon. Once you have the radio release keys, push them into the 4 holes in each corner of the radio (See image), apply a little pressure and the radio will release from the dashboard. The radios label will be located on the radio's casing. Please see image for reference. Step 2 - How To Find Your Sony Radio Serial. 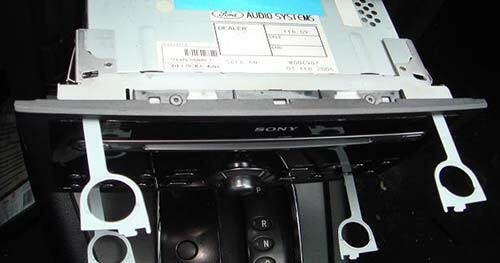 Why Choose us to Decode your Sony Radio? Most of Our Sony radio codes are instantly available, and display on screen after purchase. You can also call our radio experts on 01942 604333 to obtain your radio decode instantly over the phone via credit or debit card. Our phone lines are available from 9am - 5:00pm (Mon - Fri). We also offer a free Sony radio code lifetime code retrieval service, so if you ever misplace or lose your stereo code you don't need to worry! The code we provide is the original code for the radio supplied when the vehicle was first manufactured. Radio decodes are requested directly from our large databases or decoded in house by our specialist radio decoding tools.